St. Peter’s is putting on a musical! Come to the Sanctuary at 3:00pm on Sunday, March 3rd to see and hear the story of Noah, an enormous boat, a lot of animals, and how God’s promises endure forever. 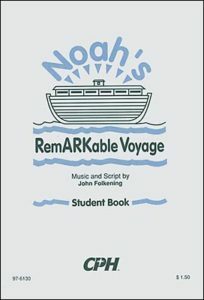 This year the families of St. Peter’s will present the story of Noah and the Flood in living color with words and music of John Folkening’s Noah’s RemARKable Voyage. Held in the sanctuary, showtime is Sunday, March 3, 2019 at 3:00pm with a reception to follow in the Narthex. The cast have been learning music and dialogue, choreographing dances, and bringing the story to life over the last couple of months and is very excited to tell the story. Our production includes original set pieces created by members of the St. Peter’s community and features the children and youth of the congregation. Although the cast is excited to present the show, they need your help! This year’s show includes a chance for the audience to participate. Want to find out how? Come to the show! Noah lived in a time when all the people of earth were behaving badly and God decided to start over by flooding the earth. God chose to save Noah’s family along with animals of every shape and size, asking Noah to build an ark and to gather all who would be saved into it. The rain came and the water levels rose. God’s chosen had to cope with boredom and rough seas, but at the end, God brings them to Mt. Ararat. After dropping anchor and leaving the boat, God sets a rainbow in the sky as a sign that God will never again destroy the Earth by a flood.